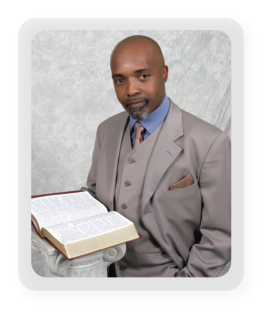 Pastor J. C. Fryer was born on September 11, 1969, to Rev. Jimmy & Sis. Cornelia Fryer of Louisville, Alabama. He acknowledged his calling int o the preaching ministry on April 5, 1987. His initial sermon was preached on May 3, 1987 at the Mt. Nebo Baptist Church Clayton, AL. He graduated from Louisville High School where he graduated with honors and was ranked third in a class of seventy-six students. After graduation he attended Troy State University on a full paid tuition scholarship. His area of study was mathematics with emphasis on computer science and business administration. He received his Bachelor degree in May 1991. While working on his undergraduate degree, he enlisted in the United States Army Reserve and was discharged with an honorable discharge in 1996. On May 30, 1994, he received his master's degree in secondary education from Troy State University. In August 1994, the Barbour County Schools employed him as a math teacher. He is presently employed as the Superintendent of the Barbour County School District. Pastor Fryer has attended Selma University and Howard Theological College of Stanford University. He has also completed post-graduate work at Troy State University in school administration. He is a doctoral learner at Capella University, Minneapolis, Minnesota pursuing a doctoral degree in Educational Leadership. Pastor Fryer has been blessed to serve 5 different congregations in his pastoral ministry, including the Pine Hill Missionary Baptist Church Phenix City, Alabama, which he presently has served since July 2000. He is married to YuLanda Caldwell Fryer. They have three children: Jasper, Jarel, and Janiah. Pastor Fryer believes that the Lord gives "pastors according to His heart." It is his firm belief that the Lord has given him to Pine Hill Baptist Church for a season.